A Mid-GLAM camper plays with the color changing slime she made. What better way to get a bunch of middle school girls excited about Materials Science and Engineering than to let them explore color and making things pretty? 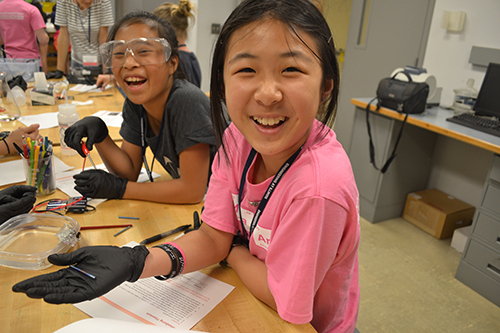 That’s exactly what Mid-GLAM, named after its sister camp GLAM (Girls Learn About Materials) did by exposing them to different hands-on activities and design challenges. 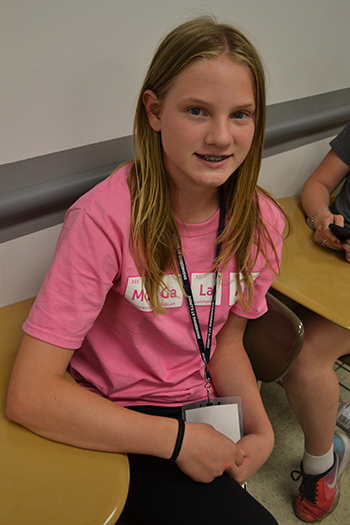 Mid-GLAM is a summer day camp for middle school girls interested in learning about Materials Science and Engineering. 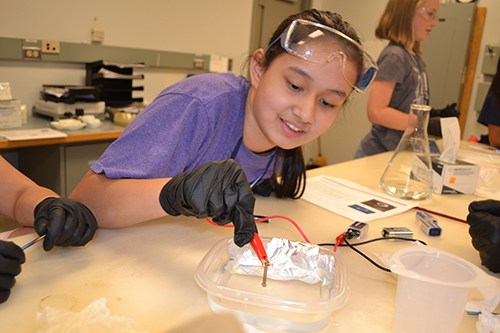 Orchestrated by the camp’s co-directors, Materials Science and Engineering (MatSE) Assistant Professors Cecelia Leal and Robert Maass, it made its second annual debut from June 25–June 29 and served students from all over the state. Mid-GLAM camp co director Robert Maass interacts with a camper during the Making-Stuff-Stronger session. A Mid-GLAM camper works on annodyzing titanium. Instead of admission being on a first come, first served basis for local area middle school girls, it was opened up to include 20 girls from middle schools across Illinois and was also based on a paragraph written by the students about why they wanted to participate in the Mid-GLAM camp. The theme of this year’s camp was how to make things better. The topics included were Making Stuff Stronger, Making Stuff Smarter…Cleaner…Faster…Safer…Prettier…and Colorful. Each morning, students were able to see demonstrations, videos, and participate in hands-on activities pertaining to the selected topic of the day. After lunch, they participated in design challenges that focused on that subject and learned how to make them better. This year, Making Stuff Colorful and Making Stuff Prettier were added to the camp’s schedule. 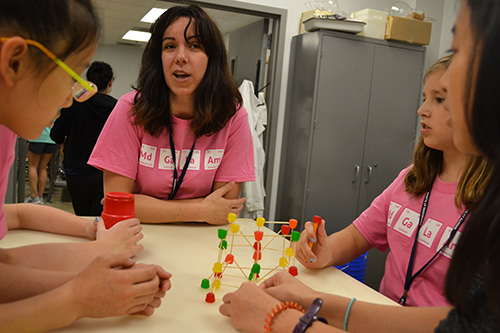 Assistant Professor Cecelia Leal (second from left) speaks with Mid-GLAM campers about their gumdrop structure. Making Things Colorful was added to the agenda when Professor Renske Van der Veen joined the Mid-GLAM team because she does a lot of work with color. Students were able to figure out how to change the color of materials to make them pretty, but they were also able to learn about why color is important in materials science. Color coding is used in stoplights to associate red and green with stop and go, an example of how color is used in our everyday lives. Another way color can be used is for sensing. A device can be programmed to change color when you sweat to tell you that your blood sugar is low or that you may have cancer. 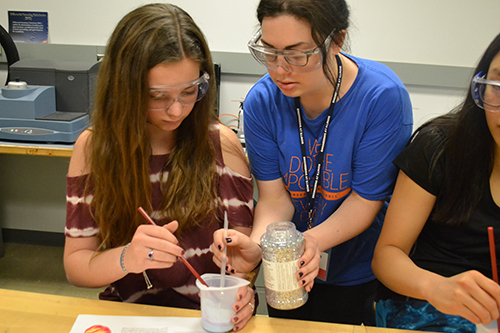 Jill Carbone (second from left) helps a camper add glitter to her slime. 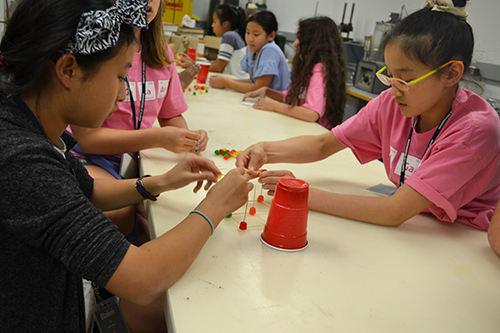 Mid-GLAM campers work on their gumdrop structure. This is exactly what was done during the Making Stuff Prettier activity. The girls explored the concept of thermochromics during the activity when the slime they made changed colors as it was cooled. This activity was especially favored by participant Katie Delaney, who came to Mid-GLAM because she thought it would be fun and could meet new friends. A Mid-GLAM camper, Gianna Cannek. Earlier that day, the girls got involved in another hands-on activity related to Making Stuff Colorful, which piqued the interest of one of the other participants. 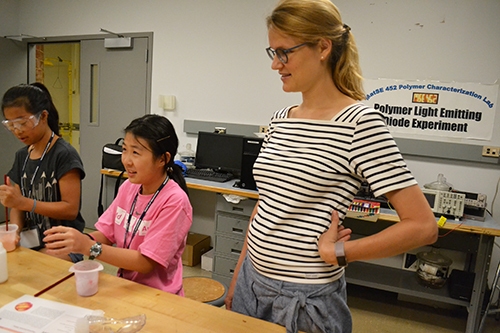 Assistant Professor Renske van der Veen (right) watches as campers make their colorful slime. In addition to the support of the National Science Foundation, the MatSE department at Illinois, and its faculty members, current MatSE students also supported the cause by getting involved in Mid-GLAM because they see the importance of outreach to younger girls. For example, MatSE junior Carbone admitted that she had no idea what materials science or engineering was when she was young because she didn’t have the opportunity to attend a camp like Mid-GLAM. A Mid-GLAM camper shows off her now colorful piece of titanium. In fact, Carbone says she grew up on a different path. She was set to go to Juilliard because she played piano for 15 years; however, this all changed after her sophomore year when she fell in love with STEM, which came as a surprise to her family since she was always known as the artistic one while her brother was the scientist. Story by Brittany Rhed and photographs by Elizabeth Innes, Communications Specialist, I-STEM Education Initiative. 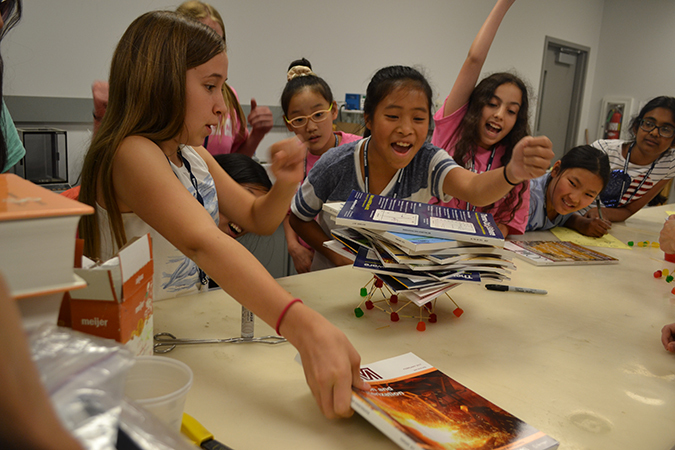 A group of campers celebrate as they win the gumdrop challenge.